What is good: Packaged well, looked exactly as expected. Size is perfect for what I plan to do with them. Product use: I am planing to use it for my wedding invitations. What is good: It is the correct size and will fit just enough paper size for my message in a bottle. What is not so good: I was asked to pay extra for the customs. I did not see it being mentioned on the website. 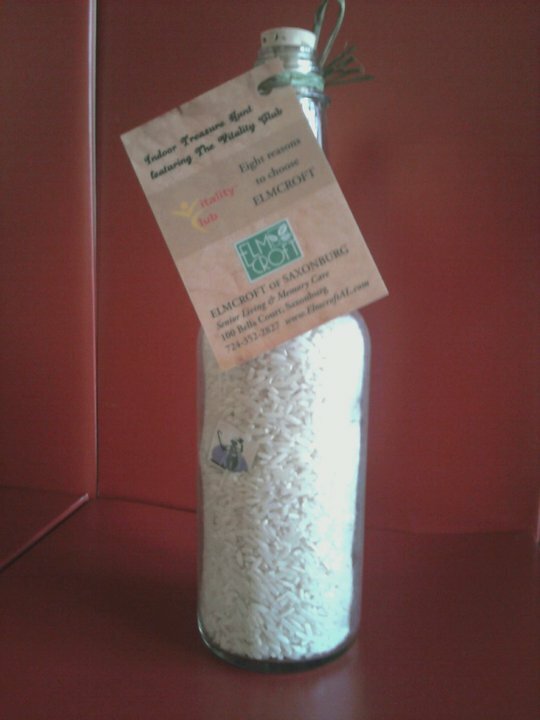 Product use: We used the bottles for wedding invitations to a destination wedding. We have had amazing feedback. Everyone says "Best invites ever." What is good: The bottles were perfect and we had extra corks. Note the opening to the bottle is very small so we had to roll the invitations very tightly and had the crease the paper. About the service: Good service, bottles arrived very quickly and were well packaged. I would recommend this website! Headline: So Far, So Good! Product use: Not yet, but pleased with size, look, etc. Ordered cork stoppers. Will use them in another 2 months or so. Just hope the stoppers fit tightly and dont leak. We are planning to fill ours with quality Italian olive oil and put on a label and tie raffia around top and use as wedding favors. About the service: Very prompt. Product use: We made the invitations and they were awesome. I will order again for my next occasion. They were a hit. What is good: There were no broken bottles, we even received extra corks which came in handy. Product use: I am going to use them for party favors for my beach wedding. What is good: I loved the bottles! They were exactly as described on the ebottles website. About the service: The service was extraordinary! eBottles really went out of their way to deliver great customer service! I had been looking for a while for the components to make my message in a bottle party favors and found them at the best deal online with ebottles! I checked everywhere else including ebay, etsy, and other similar websites and no one had a better price. I had ordered them online and the website did not let me order my two quantities in the same order so I had to pay double the shipping. I was going to call and ask about that, but, before I could, ebottles called me and lowered the price based on shipping for me! the lady I spoke with was very pleasant. All updates on shipping were great! Thus, i was well informed on the status of my package throughout the entire process. It was on time and everything arrived intact. Also, the website was easy to comprehend; very user friendly. The only recommendation I would give is to fix that problem that I encountered (the website did not allow me to purchase a second quantity in the same order). Everything was great either way because ebottles was prompt to call and fix that! I would order from ebottles again any day! Product use: I used these for my wedding as party favors. I searched a number of sites before I decided on this one. What is good: I ordered the 50ml size and its the perfect size for my need. The glass is sturdy and not too fragile. The corks fit well. The shipping box was well packaged and I had no broken items. The price was right even when you factor in the shipping cost. What is not so good: I have no complaints and will recommend this company to others. About the service: Prompt service and on time delivery, accurate invoicing good description of item, and prompt email confirmation made this a great company to come back to and recommend. What is good: Strong. Not concerned they might break. What is not so good: The hole could be a bit bigger. We had a Renaissance theme wedding and the threading on the top kinda took away from that as bottles did not have threaded tops back then. However, everyone LOVED them and prob didnt even notice. Im just picky like that. Product use: GREAT product and GREAT price!!! They are the party favors for my wedding and they are perfect! Thank you!!! Headline: I love it .... Great .... So cute!!!! What is good: Very durable - survived the plane ride! Came in excellent packing material; very fast delivery! About the service: Excellent! Appreciate the quick turn-around! Product use: The Bottles worked beautifully! I made organic garlic/rosemary/sun-dried tomato dipping oil as gifts. Product use: I ordered these for our wedding. I am going to use them to put everyone names and name numbers on them. What is good: They are a great size! 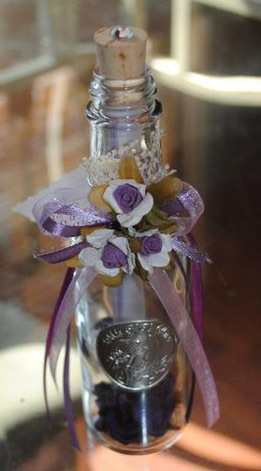 Product use: My mother and I used the bottles as a wedding favor. Instead of inserting a message in the bottle, we made our signature liquor. What is good: The size of the bottle was awesome. Product use: I used them for a church function. They were perfect. 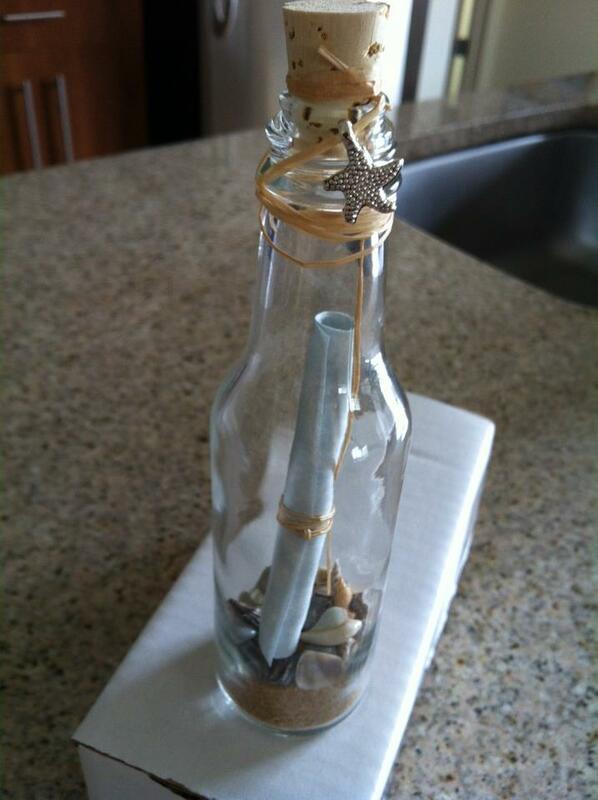 Product use: I am using this product to make my weddding favors "message in the bottle". these small wine bottles can not be found anywhere in stores. What is good: Im happy that it was inexpensive so that i could purchase a large amount especially since I had a difficult time finding what i needed until i came acrooss e-bottles online. Product use: Used this with a leadership team that wrote individual commitments to their team and company in small pieces of paper that they put into the bottles (message in a bottle). They gave the bottle to another team member who will keep it and open it on January 1st 2013. They will then connect with the person who wrote the commitment to check in on how they are doing on it. Cool exercise! About the service: The bottles had to be sent to a location in Florida and had to be there on a certain date. This company was absolutely trustworthy and not only delivered well ahead of time but kept me updated on the delivery process throughout. Product use: The bottle was used as a favor for the guest at retirement celebration for a husband and wife couple who retired from a steamship company. Product use: For a wedding as favors...not a beach themed wedding but my fiance proposed on the beach at our favorite spot in Myrtle Beach SC where we go on vacation every year. We collected sand and shells from the beach that vacation to add to the bottles. What is good: Perfect size for a wedding favor; and im sure my guests will love it. Great quality and pricing; ordered 168 and my guest list is growing so I will have to order MORE! :) WILL RECOMMEND TO FRIENDS AND FAMILY! Product use: Filled with oil and vinegar for bridal shower favors. What is good: Well made product, sturdy and good looking. About the service: Your service was exceptional. I was so surprised how quickly the shipment arrived! What is good: They were all in perfect condition, and were received in a timely manner. Product use: We are using them for wedding invitations and they look fantastic. What is good: The 5oz bottle is a perfect size for the invitation and it looks great. What is not so good: It is difficult to find a label to put on the bottle. About the service: the service and time of delivery were fantastic. 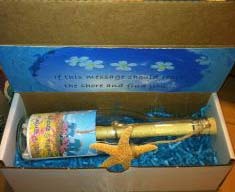 Product use: the rehearsal dinner for my son was at a beach house and the message bottles were just perfect as a small gift to give to each attendee with a personal message from me. What is good: the "old glass" look the bottles have adds charm and mystery to the bottle. Product use: We love the little message in the bottles so much that this is our second order! I am considering ordering the tureen bottles soon. And maybe when we place our order I will get the sand and shells. My only suggestion would be to sell scrolls to go along with the bottles. We are so happy to have found ebottles! What is good: Perfect size for wedding favors. About the service: Very prompt, addressed all concerns in a timely and professional fashion. Headline: PERFECT! The dimensions were exactly as stated...all of my measurements worked perfectly. Quality is great! What is not so good: Nothing. Headline: I am very pleased with the bottles I ordered from your company. What is good: everything was in good shape. Thank you. I would recommend your site to anyone who would need bottles. 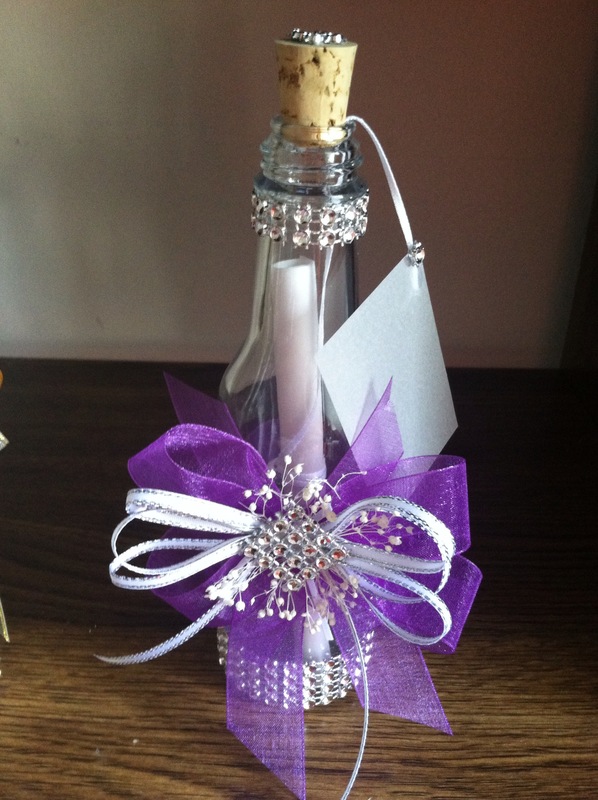 Product use: Our daughters wedding.We put a scroll with her wedding information on it.Tie a black ribbon on the bottle and gave out as a gift for her destination wedding. What is good: Memory was made.Some people selected to put sand in theirs. What is not so good: they are a lot smaller in person, on line they looked like the ideal size. When I recieved them I thought they were the 5 oz bottles. About the service: The service was great, very patient. What is not so good: nothing - they wre exactly what I was looking for. Headline: bottles in perfect condition. What is not so good: It takes a week to get them in Los angeles/Orange County area. Product use: We are using the bottles for table designations at our daughters Tropical themed Bat Mitzvah and to insert a thank you message from her. What is good: The size and the color and strength of the glass is perfect! About the service: I am disappointed that the website had inventory for 8oz, but then no inventory till 12/24. From eBottles: Stacy, thank you for your feedback. We update our inventory at the end of each day. Sometimes it can happen that orders placed during the day deplete our stock. Our apologies for the confusion. You should have received communications from us right away to indicate we were out of stock. Headline: Too much fun ! What is good: nice to work with and 1.25 cups is perfect amount. About the service: excellent. Was told the bottles I wanted were out of stock, but a larger size would be sent for the same price... when they arrived 3 days later, they were the original ones I wanted!! Product use: I live in Florida so the beach is down the road. We went to the beach every weekend bring home sand and shells. After cleaning and drying them we filled the bottles with a bit of sand and shells with the wedding invitations. They came out perfect! What is good: I we had to do is fill the bottles since we got the boxes from here too. Made our special day so much easier. About the service: No issues except there were not enough corks for the bottles but I bought some more. From eBottles: Dear Loretta: We apologise for your being short a few corks. If you had let us know we would gladly have sent them to you at no charge. 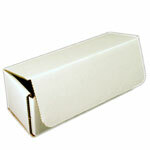 Product use: We used this product to send out my daughters wedding invitations. She is having a beach wedding and these fit right into our theme we wanted..
What is good: The product arrived safely without any breakage and was very well packed. About the service: Ordering online was very easy! Product use: Im going to use them for wedding invitations for my daughters beach wedding. What is good: it was just what I was looking for. The size is perfect and its great they came with corks. About the service: Great service, no problems with ordering at all. Fast delivery packed very well. Product use: Mix your own dipping oil for Italian theme birthday party. What is good: Great size and appearance. Product use: This product was used for my 15 invitaitons. We decorated the outside of it with swirls and a little glitter with a satin rose bud on the top. What is good: That they make the invitation special and different as well as fancy. What is not so good: The spout of the bottle is to narrow. We had a hard time finding something that would hold the invitaion rolled up. We ended up using small rubber bands but still people are having a hard time with them. They either break while rolling it off and then they cant get it back in. About the service: At first a bit fustrating since you advertise you did have them and then to find out that they were not available. To make matters worse is that there was no date to be given. But luckly they did arrived on time and I was able to get them. Product use: I had been purchasing our bottles for our business through another company for years but it lacked the service we hoped for. Our first contact was with a representative by the name of Hillary, even though our first order was a small one she was fantastic to work with. Our order was shipped on time with no problems. We @ Sassie Sharons Gourmet Flavored Vinegars will certainly be making ALL our purchases from her. We so appreciate good service!!!! What is good: Exactly what I needed and was looking for. About the service: Excellent! I waited to the last minute to order, and the product came fast, and as promised. Headline: Fast shipping! Got exactly what I ordered! 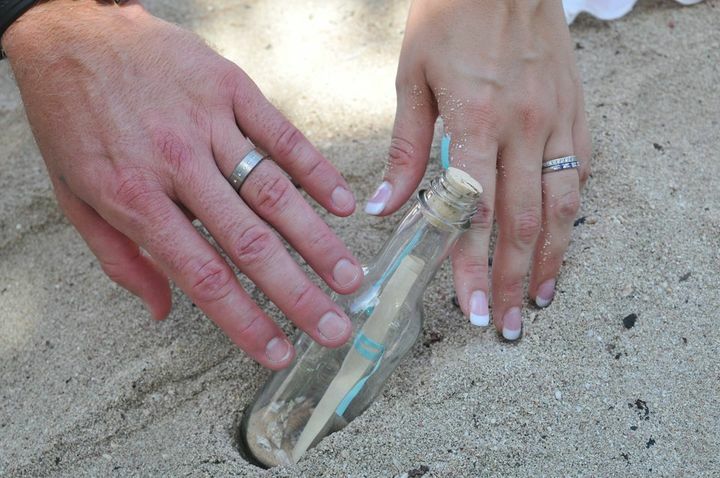 Product use: I put sand and shells in them, added personalized tags, and gave them to the guests at our wedding. What is good: Fast shipping! Appreciated all the packing. Product use: Party gift filled with home made liquor. Product use: I used this Product for some invitations that I greated for my small business!!! What is good: Bottles are in perfect condiction as they arrive, quick and fast delivery. About the service: Fast Delivery and East to order....!!! Product use: Made wedding favors. What is good: The only place that had what I was looking for. What is not so good: Mold line is takes away some of its appeal. About the service: Excellent! UPS shipped my order to the wrong address. I called your customer service and I literaly had a replacement shipment the next day. I was worried that I would have some broken bottles with such a large order, but they were packaged well and I didnt even have a chip. Product use: Havent used them yet: still waiting on the "right" moment. The bottles will be used in a music video. What is good: Perfect size for what we are wanting to accomplish. Just a great look. What is not so good: Cant think of any. About the service: Good identification of the products made ordering online a breeze. Product use: We used the message bottles as favors for our yacht dinner cruise. What is good: We were able to put thank you messages in the bottle and added colorful rocks and ribbons for a splash of color. Headline: We were very pleased to have found the bottles! 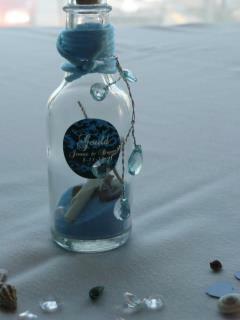 Product use: My daughter had her sweet 15 b-day with an underwater sea theme and the bottles where used as invitations. They we used etching cream to put her name and date on the bottles and decorated with blue sand and shells and had the invitaiton inside. What is good: Everything was perfect. About the service: We receieved the bottles sooner than expected! What is good: The bottles were a hit with all of our guests! ebottles made ordering super simple by having corks and shipping boxes available. I even used the packing peanuts they put in their shipment box to package my individual bottles.